Carolina Colours button front cardigan Christmas theme, good condition, minor wear Ramie/Cotton blend Size M MEASUREMENTS Shoulders 17" Chest 40" Length 20"
BellePointe Vintage Red Cardigan Ugly Sweater Women’s Size Large L Hearts & Buttons. Heavy material 45% cotton 55% ramie. Ugly Christmas Sweater. Length of Sleeves: 21" long. Length from top to bottom: 25" long. Size Large. Across the chest (buttoned): 20" wide. Tiara International. This is a Heirloom Collectibles sweater from 2004. It is a cardigan style sweater. The flowers are on top of black velvet fabric on the collar and cuffs. Ugly Christmas Sweater Embellished. Vacationing Santa; Palm Trees, Surf. Shoulder to shoulder - 14.5". Sleeve from shoulder seam - 22.5". Board, Sandals and Fish. No observed flaws. Previously worn. Color may not always be an exact reflection of the original due to lighting and the device you are viewing them on. We strive to give you a clear and honest presentation of the item. For your convenience, you have been provided with high quality photo's from various angles. We run specials every month. We do our best to fit as much as we can into a flat rate priority box if it will save you money. Length: 27. Sleeve (shoulder seam to cuff): 22. We have five basic categories when we decide what condition the item is in. Inventory # Sweater box. SLEEVE : 23” SHOULDER TO CUFF. LENGTH : 21” TOP OF COLLAR TO HELM. Storybook Knits Sweater. 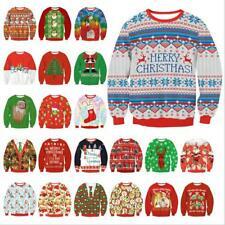 CUTE or UGLY Christmas Sweater?. Designed with 2 Angels. Pit to pit: 26". 6 Gold tone bow buttons up front to V-Neck. Embellished with gold and silver stitched detailing. Good Condition. Granny style ugly Christmas sweater with velvet embroidered bulbs amd satin bulbs. No condition issues. Size small. 55% ramie. 45% cotton. Label reads heirloom collectibles 2003. Lovely embroidered poinsettias w/ beading & sequins on upper body. New CROFT & BARROW LIGHTWEIGHT CARDIGAN SWEATER. 55% Cotton, 45% Acrylic. Excellent NEW condition. No stains or other condition issues noted. The button-front cardigan features an adventurous pair of skiiers on a mountain and forest landscape, with two playful deer galloping around the bottom. Each of the 7 silver-tone buttons are engraved with an eye-catching deer and mountain scene. Quacker Factory Women's Small S Winter Angel Christmas Holiday Cardigan Sweater Description: ---Tag Size: S ---Measurements: Please see final picture ---Material: 55% Ramie 45% Cotton ---Winter Scene on front, Angel on back ---Embellished and appliqued. Hidden front buttons. Condition: ---Pre-owned. Gently used, no flaws. No returns on seasonal items, thanks for understanding!. It features colorful Santa's dancing around falling snowflakes. It also has an embroidered "S" pattern along the collar, cuffs, bottom edge, and down the front. Beads also run down the sleeves, and the pattern is repeated on the back. 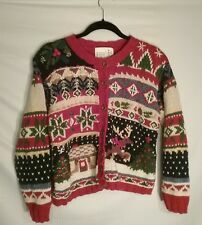 Tiara International Christmas Collection Red Cardigan Sweater. Felt snowman on the front of the sweater and plain on the back. Colors can appear different depending on your device (computer, tablet, phone, etc), its settings, and lighting. Candles and presents on sweater. shoulder seam to shoulder seam 17 1/2". removable shoulder pads. Chest (armpit to armpit) 26". Weight 29 oz. Item has no stains or defects only normal signs of wear. Happy shopping! (New runway sweater, stretch, yellow color, V neck, button close, full fashion bee. Size S:Chest:86cm(34") Waist:") Shoulder:") Length:60cm(23.5"). Size M:Chest:90cm(35.3") Waist:") Shoulder:") Length:61cm(24"). Adorable and seasonal, snowman add a touch of whimsy to this zip-front cardigan from Breckenridge. Cotton/Polyester Machine wash Zip-front cardigan Front pockets Snowman appliques with embroidery and rhinestone embellishment Point collar Hits at the hip NWT, new with tags MSRP $48.00. Button front. 55% Ramie 45% Cotton. Decorative accent stitching at all edges. Beaded and embroidered. Darling Christmas Cardigan. Size Small. Shoulders at back between seams: 15". Length: 20". Christopher & Banks Christmas Sweater Cardigan. Is in very good, gently used condition. (New runway sweater, fashion and beautiful, red crowned crane, carp embroidery, it is lucky design, button down. Size L :Chest:98cm(38.4") Shoulder:") Waist:") Length:61cm(24"). Bottom width from seam to seam: 17". Sleeve length from shoulder seam to end of sleeve: 21". Shoulders from seam to seam: 18". Sleeve length from pit to end of sleeve: 18". Cuff width: 3". Front neckline to hemline: 22.5". Length 29-1/2”. armpit to armpit ( laying flat from left to right) 21-1/2”. Ramie Cotton Blend. Back is solid black. SML Design. White w/Gold & Silver Sequins & Beads Christmas Balls Applique Sweater. this sweater shows a little wear so I have priced it lower than I would otherwise. It may just need a good washing to brighten it up. A few loose threads and bling pieces; a touch of wear at armpits. Length, from shoulder: 28. Waist: 24. Chest, armpit to armpit: 24.